Productivity is an important term which is mandatory in every individual’s life. It is real that an individual gets about 24 hours a day, and how many hours or minutes is the individual making productive? Effective usage of resources at the right time can make even minutes and seconds productive. There is no requirement for only hard work to be productive, a few things and its effects which are done in minutes can make your chore productive. When you are free out of real work than you have productive things to do on the computer, do follow these tips and make your work productive. Every laptop would have dozens of files and folders scattered everywhere. Arranging all the files and organizing them in the right manner can be beneficial. When you have them set in the right location it can be easy to locate them at times of need instead of wasting time searching them. When you have some time left and desire to use it beneficially with a computer the best way can be to clear all the emails in the inbox. It is usual that all employees would have an overflowing inbox with all necessary and unnecessary mails in it. Processing each mail and clearing the inbox can be one way to do with the computer. A virus scan can be another beneficial and productive way which can be done with your system. When a virus scan is accomplished, it would be good that the computer is got rid off viruses and all your data is safe. There are a number of high quality and informative blogs available online. Reading these blogs can be interesting and knowledge gaining. Reading through the latest technology blog tips can be considered as a productive way with the computer. The laptop or system one uses should be backed up once in a month so that no data is lost. In that aspect, loss of data can be avoided and work can be carried on without hassles. There is huge confusion when data is lost, so to avoid it backing up of data is mandatory. Spending time on social networking sites is also a productive way. Developing profiles on these sites like facebook, twitter, Stumbleupon, Digg, LinkedIn, delicious and more can be advantageous. Though you do not use or post anything on these sites, reading the articles and posts from others can make your time productive as you can gain knowledge out of it. Changing passwords can also be accomplished as an important task. It is good to change passwords for bank accounts and primary emails once in a year. A unique and strong password is to be used for these important logins. The multi-platform password manager can be the right choice which can be used to store up all passwords. It is always beneficial to customize the home page portal which can be beneficial in many ways. If you do not possess such a customized page, do work on it and develop a customized page so that time is saved on certain aspects and you turn more productive. Wikipedia is a rich source which can be used to learn and understand more information. In that aspect the technology portal of Wikipedia can be used to read a number of useful information and knowledge can be gained. The internet is a vast separate world of knowledge; there are so many things which can be learned from the web. Try to search for new concepts and learn them each day. Interesting facts, newsletters are more beneficial and makes you productive. Speed reading skills are important for any employee. Rocket fast reading and understanding of mandatory concept in that reading part is necessary. In that manner there are a number of online links which help an individual read faster. Scheduling just fifteen minutes of time each day is ample to encourage and enhance fast reading. A new language can be learned by using a computer and made a productive output. In that aspect there are a number of most demanded languages, where a single word per day can make you complete the whole course when learned with dedication. Your hobby can be made broader and more aspects of your hobby can be known by making use of computer. The conversations and resources related to people belonging to your same hobby can help you know more about it and enhance your skills. When you have ample time and desire to use it in a productive way, freelancing can be the right choice. Figure out if you possess freelancing skills and make the right use of them online and turn out to be productive. Get to know what’s happening around by reading or watching through quality news portal such as BBC or NDTV news and other international news portals. By this way the happenings across the world can be known. With the number of shopping sites, selling unwanted things and buying necessary things can be accomplished easily and productivity is achieved. Hunt the sites and get to know the rates, where you can also post your stuff for sale. There are a number of brain games and math puzzles which make an individual relieve from stress and makes mind fresh. There are also other advantages where the individual focuses more on work. When there is free time family and friends can be remembered by making a skype call online. a hearty chat with friends can be another way which can make you feel refreshed and productive. Updating the social profiles from their old status can be another way which makes your time productive. Avid online shopaholics can make their time on computers productive as there are a number of coupons and discounts that are available and gain you from online shopping. The price offs and discounts are available for regular shoppers too. There are plenty of apps these days which can be found on google play store. The apps and games are making their entry day by day and making life a bit easier and organized. Anyone can make their professional and personal life more flexible with the variety of apps available. Using a keyboard instead of a mouse can speed up your task and also elevate productivity. When short cuts such as Ctrl A for select all, Ctrl C for copy, Ctrl V for paste and Ctrl S for save are used rather than grabbing the mouse and pointing on specific places, it would save time and make your chore easier. There are number of other function keys also which can be utilized for shortcut method. The task of unsubscribing from any newsletters or services which you think is unwanted can be well accomplished when you find time and have a computer. You can avoid unwanted mails that load up your mail box and also make your valuable time productive. Post some articles or other stuff that is appropriate with your industry so that you can gain a conversation or discussion with your contacts and know their opinion about the same. When you find time make sure to complete all the pending work you have. It would be good and leisure way to complete small tasks which you left undone. Thus your actual work is undisturbed when such tasks are completed and your time is used in a productive manner. Obtaining a fast PC is considered as one of the smart ways as by this way, all programs and pages are loaded faster. In the same manner it would be good if one starts to work at least for 25 minutes without distraction. By this way work will be completed in full swing, by the end of the session a break can be taken. Making use of dual monitor can be a perfect choice for ones who desire to use many windows and switch of amongst them. Placing the most used windows on one position and the others, where the eyeballs are just pivoted can make more productivity. These are a few hints which can be followed to elevate productivity. The web has a number of options that show up productivity, these few hints can be beneficial to the readers and they can very well make use of it in their free time. 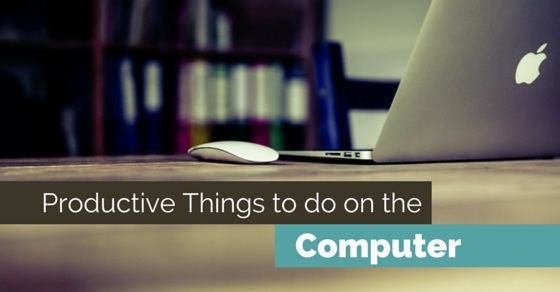 There are many productive things to do on computer and we as humans can use our free time to achieve multiple tasks on computer. Next articleHow to Make your Resume Look Good without Experience?